Seeing a need in the Maldives for more 4 star, family , premium all-inclusive resorts, Centara built one from scratch (having dismantled what used to be Machchafushi). 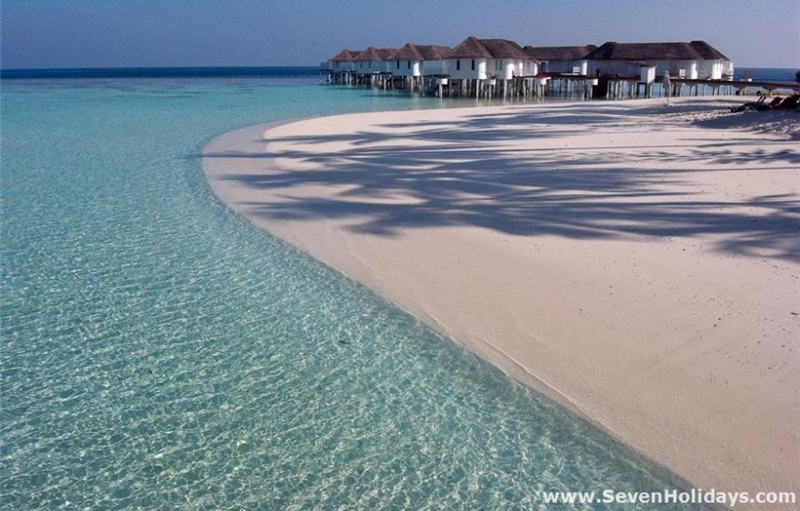 It doesn’t look like a typical Maldives resort but it works brilliantly. 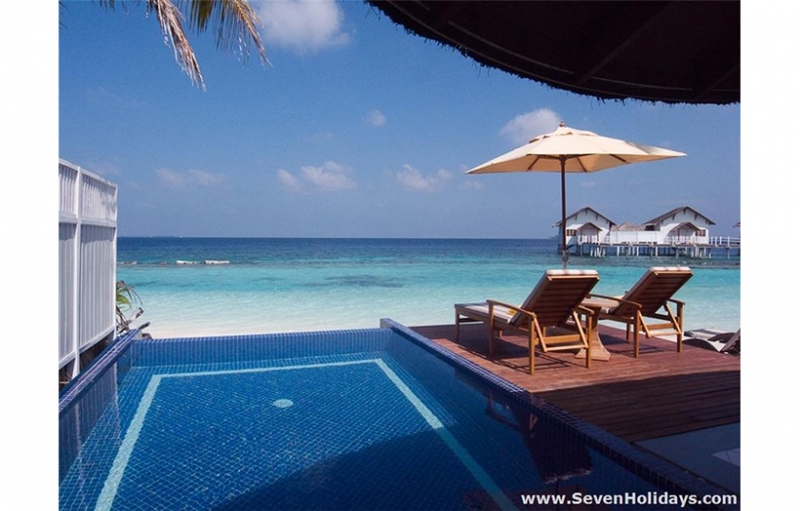 It competes on an equal footing with Lily Beach and just a little behind Constance Moofushi. The clientele here is very international, with no individual nation having more than 20% of the rooms (except perhaps during Chinese New Year). The staff are from many different nations themselves and all are very well-trained and led. They set a friendly and fun tone that settles across the resort. 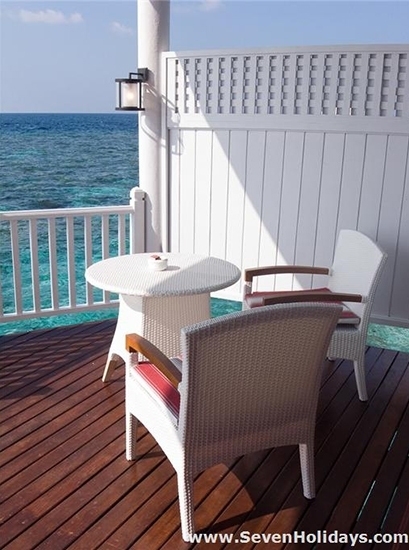 Rather than copying the brown and tan colour palette of the classic thatch, wood and sand resorts, Centara have created something with the air of a seaside Mediterranean village or possibly a sun-baked Caribbean idyll. The colour scheme is all white and blue with touches of yellow, right down to decorative details like model sailing yachts and lighthouses. There aren’t actually any picket fences and clapboard houses but that’s how it seems. 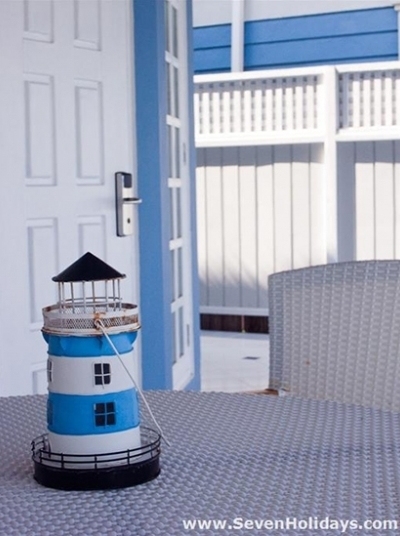 It’s impossible not to be uplifted by the lightness and seaside holiday of it all. 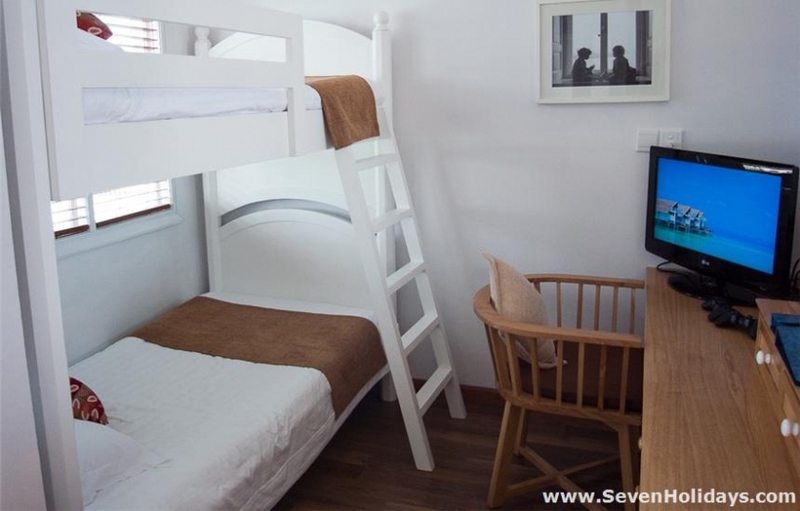 The starter room category, the Beach Suite, feels a bit smallish at 87m2 but will accommodate an extra bed and a cot. These rooms are semi-detached and mostly found on the sunset side (32 out of the 42 total). The facilities and amenities are impressive and the same for every room. On top of what is now expected, there is a hi-fi system with iPod, tea and coffee facilities, an espresso machine and a wine cooler. The drinks and snacks in the minibar are now free. 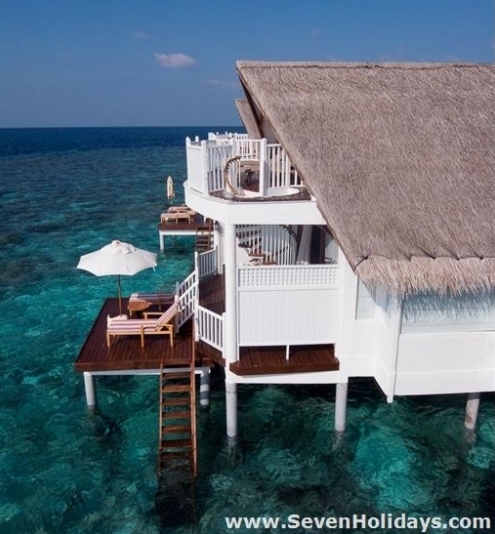 The 18 Deluxe Water Villas are the starter over-water rooms. They are lovely. Big, white and light. A day bed is there for a child and a cot can be brought in. Otherwise it suits a couple just as well. The furniture is low down, casual, informal, even fun. The 10 Deluxe Family Water Villas are similarly enjoyable inside and have an excellent little kids’ section that can be screened off. Inside is a bunk bed and their own screen and PlayStation. The room has 2 separate wash basins and a round jacuzzi. 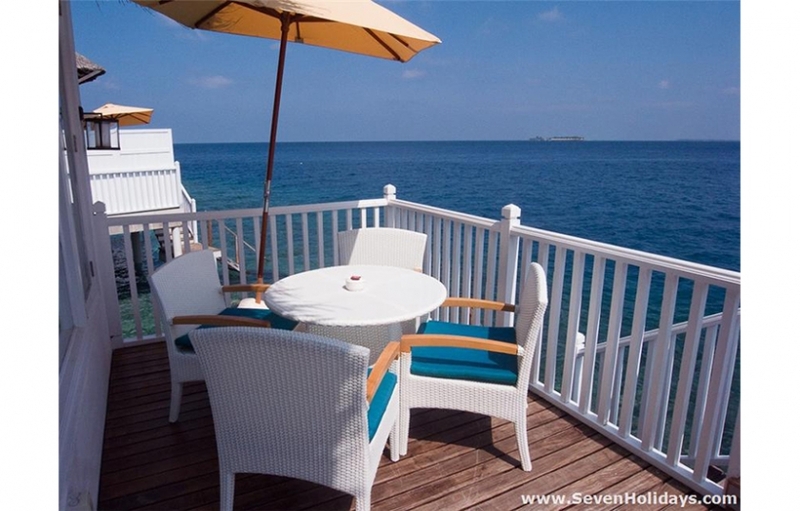 The deck is a good size, well furnished and has steps down (with a child lock) to snorkeling at the reef edge very close by. 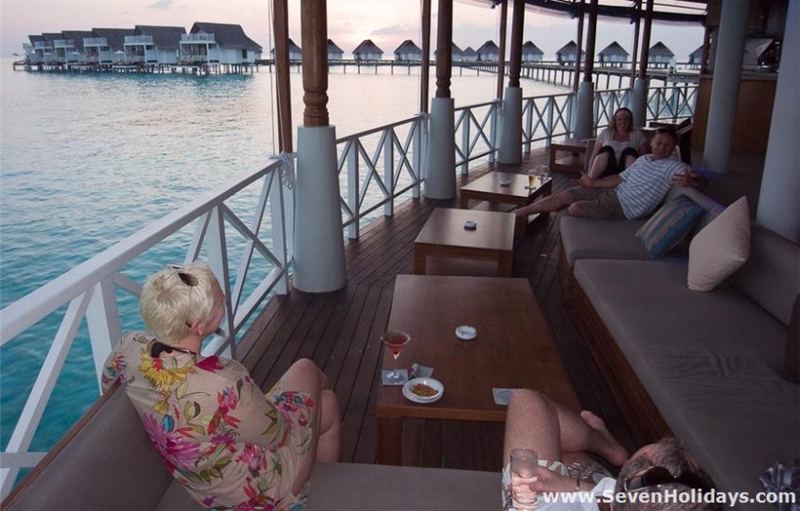 The 34 Sunset Water Villas are not so different to the deluxe water villas but do have the advantage of facing sunset, obviously. They also obviously have a second floor balcony, too, which you reach with a spiral staircase outside but there isn’t much to it except a higher view out to sea. 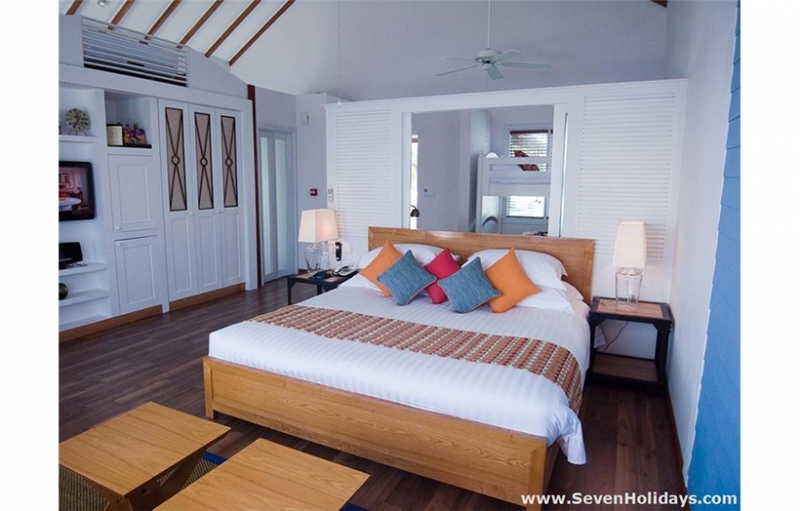 The top category are 8 Twin Bedroom Pool Villas, accommodating 4 adults and a child or 2 adults and 3 children . Each has a private pool and a separate lounge but, for me, the rooms don’t work quite so well. The lounge is a bit cramped and the garden is small with a big round tub against one wall. Still, it is the highest category and comes with automatic membership of the Island Club. The Island Club itself is a little odd to me. It is a ‘resort within a resort’, for which there doesn’t seem much purpose. 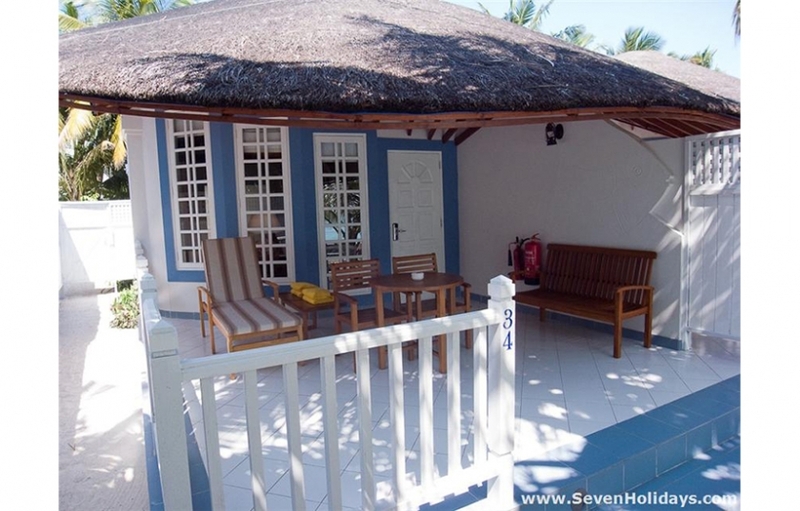 It has a pleasant pool-side area with a view to the sunset and an atmosphere where guests may make friends easily but some guests feel a bit cut-off from the rest of the resort. One is pampered more, certainly, with attentive staff offering better brands of drinks, lovely sorbets and cool towels. The specialty Thai and Italian restaurants also come within the all-inclusive package of these guests. Apart from all the twin bedroom pool villa guests, the Island Club is an option for the guests in the sunset and deluxe water villas. It should be said that the all-inclusive package for everyone is very generous and very impressive. The food on the resort is top class. The main restaurant serves excellent, varied buffets and the specialty restaurants are very good options for a change. As a Thai company, the Thai restaurant is authentic and particularly good. Guests can arrange cooking lessons with the Thai chef. All unmotored watersports equipment is free if the guests know how to use a catamaran and windsurf, otherwise one must pay for a lesson. Snorkeling equipment is also free. 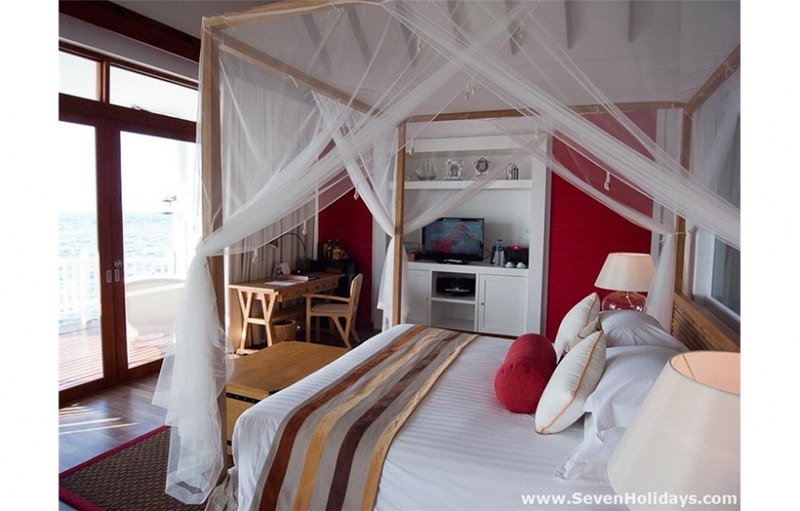 The reef is easily accessible from most over-water rooms and the snorkeling is very good. Machchafushi used to be a German dive island, and although the construction of the resort led to some local degradation, it is recovering well and the area remains a world-renowned diving zone. Evenings in the main bar tend to go on quite late with plenty of lively conversations. 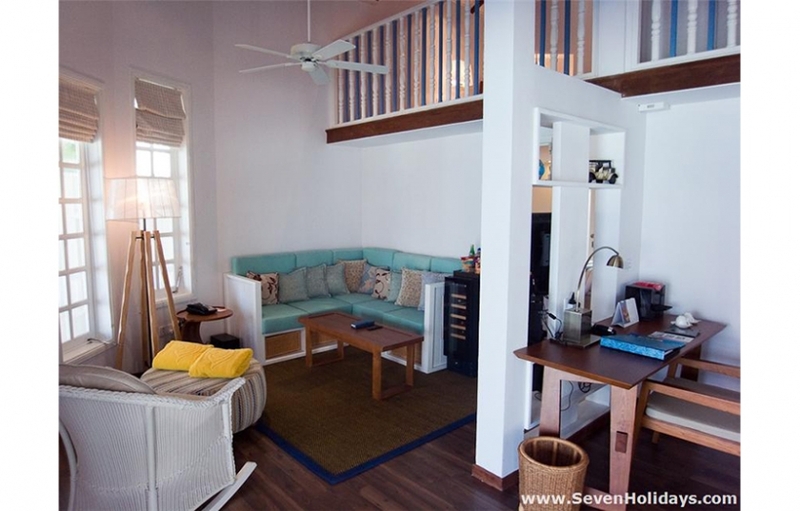 Although the resort as a whole wouldn’t be described as a barefoot place, here there is soft sand on the floor and a variety of spots and seating to settle in and enjoy a relaxing end to another good day.